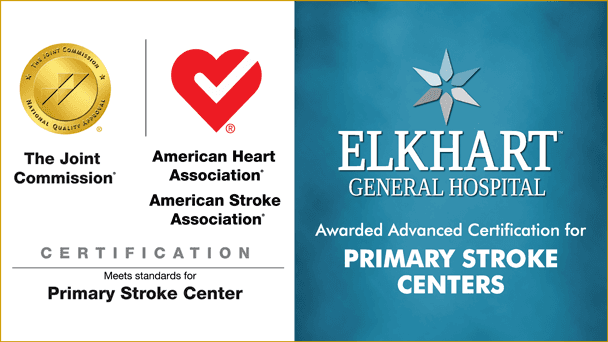 Elkhart General Hospital has earned The Joint Commission’s Gold Seal of Approval® and the American Heart Association/American Stroke Association’s Heart-Check mark for Advanced Certification for Primary Stroke Centers. The Gold Seal of Approval® and the Heart-Check mark represent symbols of quality from their respective organizations. The hospital underwent a rigorous onsite review in June. Joint Commission experts evaluated compliance with stroke-related standards and requirements, including program management, the delivery of clinical care and performance improvement. José Luis López, MD, Medical Director of the Beacon Health System Neurohospitalist and Stroke Programs, said the certification is the result of a dedicated interdisciplinary stroke committee, a supportive administrative team and the hard work of clinical teams and staff across the hospital. “This achievement highlights our commitment to providing timely and exceptional stroke care to all members of our community, and to continually strive to advance the availability of innovative and quality care to patients with cerebrovascular disease,” said ?Dr. López. Elkhart General also recently received recognition by the American Heart Association/American Stroke Association with a Get With The Guidelines®-Stroke Silver Quality Achievement Award and Target Stroke Honor Roll award.